While goblins, ghosts, vampires, werewolves, and zombies may rule the upcoming Halloween weekend, there's also plenty of live jazz and creative music to be found in and around St. Louis over the next few days. Multi-instrumentalist Lamar Harris and singer Anita Jackson will team up for the first of two nights of what's billed as a tribute to Nina Simone at Jazz at the Bistro. The Gaslight Cabaret Festival resumes with singer Kat Edmonson performing music from her new album The Big Picture for the first of two nights at the Gaslight Theater. (While Friday's show is sold out, as of this writing some tickets remain for Thursday.) For more about Edmondson (pictured, top left), check out this interview she did to promote her new release last month with NPR. 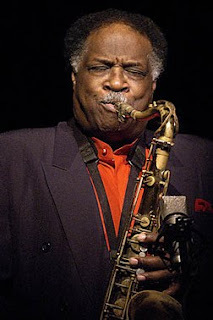 Also on Thursday, Stephen Koch, a writer and musician from Little Rock, Ar who penned a biography of saxophonist Louis Jordan, will present "Roll, Jordan, Roll: The Legacy of Louis Jordan, Father of R&B" at The Stage at KDHX; and the Jazz at Holmes series at Washington University presents "Bernstein and Sondheim: Musical Theatre and the Jazz Vernacular," a free concert featuring vocalist Katie Greenberg, pianist Kara Baldus, guitarist William Lenihan, drummer Steve Davis, and a string section. Saxophonist Houston Person (pictured, bottom left) returns for the first of two nights at Jazz at the Bistro. The veteran tenor man, who excels equally at blues, bop and ballads, will be backed by a rhythm section of St. Louis musicians including pianist Adaron "Pops" Jackson, bassist Jahmal Nichols and drummer Montez Coleman. Also on Friday, Miss Jubilee will play a Halloween-themed swing dance at the Casa Loma Ballroom; saxophonist Tim Cunningham is back at Troy's Jazz Gallery; and singer Erika Johnson and guitarist Tom Byrne will perform at Montrey's Cigar Lounge. Dizzy Atmosphere will play Gypsy jazz as part of SIUE's "International Night" at the Meridian Ballroom in Morris University Center on the SIUE campus; and Elsie Parker & the Poor People of Paris will perform at Nathalie's. The Dave Dickey Big Band will play their monthly gig at Jazz at the Bistro, with an intermission performance from the Lindbergh HS Jazz Ensemble directed by David Wyss; and drummer Montez Coleman will lead his trio plus guest vocalist Brian Owens in a concert at the Kranzberg Arts Center. Pianist Greg Mills and friends will play improvised music at the Tavern of Fine Arts; and some of Webster University's student jazz combos will show off what they've learned so far this semester in a performance at Webster's Community Music School.